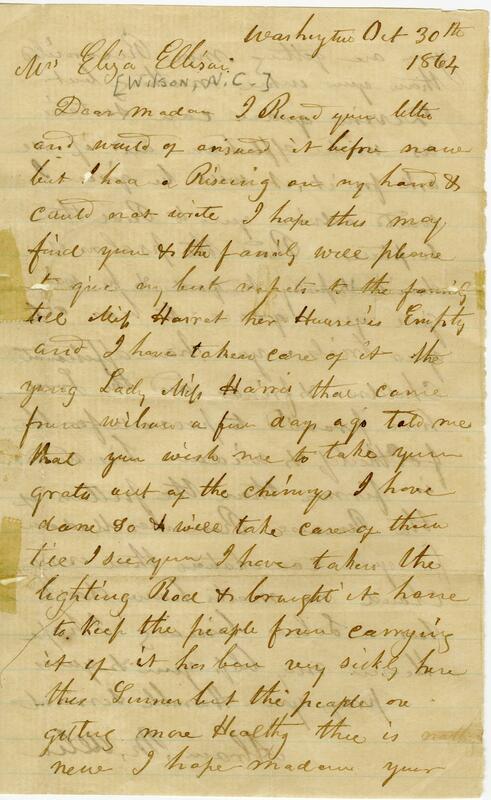 Item Description: Letter from Abram M. Allen, an Ellison slave who was freed before the Civil War, to Eliza Ellison. He offers his condolences on the loss of her husband. Dear Madam. I Rcevd yur letter and would of answerd it before now but I had a Riseing on my hand and could not write. I hope this may find you and the family will please to give my best respects to the family. Tell Mis Harris her House is Empty and I have taken care of it. The young Lady Mis Harris that came from Wilson a few days ago told me that you wish me to take your grates out of the chimneys. I have done so and will take care of them till I see you I have taken the lighting Rod and brought it home to keep the people from carrying it of. It has been very sickly here this summer but the people are getting more Healthy there is new. I hope madam your you are getting more reconciled than you were. Nuthing but Divine grace can sustane us under affliction and if we ask for it, it will be given. I would advise you to Read the scriptures Read the psalms of david and pray to god and he will give you grace to hear all your trials. You have affectionate children and friends and the Lord has promised to provide for the fatherless and widow his word is firmer than the pillars of the Univese. Remember Madam for your consolation that every cloud no matter how dark has a silver lining. I hope Heaven may keep you and yours. 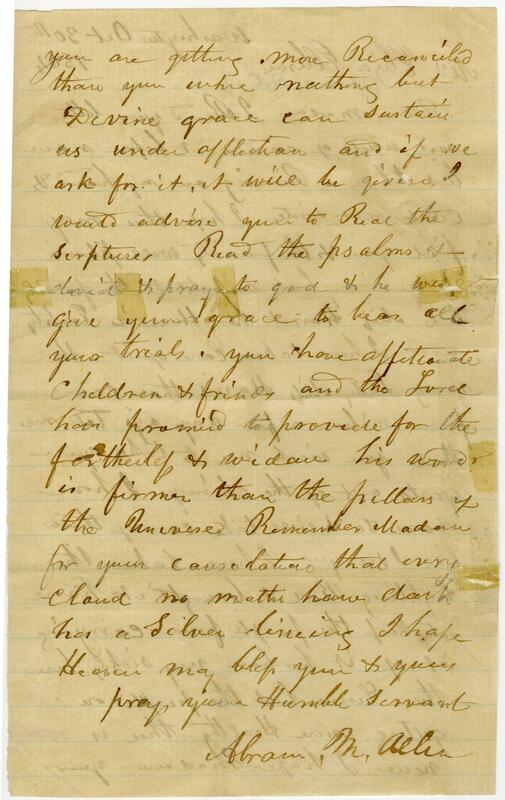 This entry was posted in Southern Historical Collection and tagged Abram M. Allen, Eliza Ellison, Henry Alderson Ellison Papers, slave letter. Bookmark the permalink.